One of the most pervasive yet preventable cancers that affect Americans is skin cancer. More people in the U.S. are diagnosed with skin cancer than all other forms of cancer. Since May is skin cancer awareness month, we are providing you with some information that will help to decrease the risk of developing skin cancer. This occurs in the structures of the of the skin closer to the surface. The most common types are basal cell carcinoma (BCC) and squamous cell carcinoma (SCC). Over 3.5 million cases of BCC and SCC were diagnosed in 2015. While all forms of skin cancer are dangerous if left untreated, non-melanoma skin cancers are more easily detected and removed. A more aggressive and deadly form of skin cancer affects fewer people than non-melanoma, with 72,000 cases diagnosed in 2015. 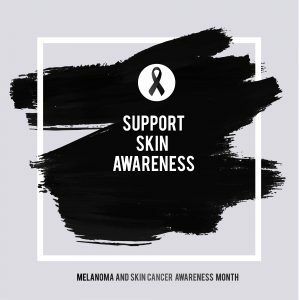 Melanoma occurs in the deeper layers of the skin and can be found even in areas that don’t receive high amounts of sun exposure. The risk of melanoma increases with age. Chronic sun exposure increases your risk of developing skin cancer because of the UV rays produced by the sun. Over 400,000 cases of skin cancer are linked to indoor tanning each year. Your risk of skin cancer increases as you age. Even if you didn’t care for your skin properly when you were younger, you should start immediately to help prevent the development of skin cancer. While lighter skin pigments are more likely to develop skin cancer, the American population has the lowest survival rate, which may be affected by socio-economic factors, not biology. Wear a broad-spectrum sunscreen when outdoors and reapply every few hours. Wear clothes that cover the majority of your skin. Keep newborns out of direct sunlight. Give yourself at-home exams to identify possible precancerous or cancerous lesions. If left untreated, precancerous lesions can develop into cancer, which is why self-checks at home are so important. Any lesion that has recently grown in size or exhibits irregular borders, color, or size should be looked at by a skin expert. At O’Neil Skin & Lipo Center, we remove precancerous lesions and other surface abnormalities not only to restore the attractiveness of the skin, but to ensure the health of our patients.